Rapidly advancing requirements for higher frequency, low loss cable assemblies have driven dramatic design innovation over the last decade in the RF coax cable market. RF/microwave engineers continue to push the existing boundaries of coax design to achieve new and improved performance attributes for their interconnect solutions. If someone unfamiliar with the RF/microwave industry had to guess when coaxial cable was invented, it might be easy to imagine that it was some technological advance, like so many others, originating from the Second World War. It is surprising to learn, however, that coaxial theory dates all the way back to the 19th century, associated with such famous physicists as James Clerk Maxwell. These theoretical origins of coaxial structures eventually developed in the mid-1800s into practical coaxial cable designs for undersea transatlantic communications. The first telephone cables spanning the Atlantic were composed of a central conductor enclosed in a cylindrical insulating material. In these earliest designs, a latex material made from the fluid of a Malaysian tree was used as the insulator because of its unique abilities to withstand the intense cold and pressures of the seabed. These early cables were considered coaxial because the seawater that surrounded them completed their return circuits. 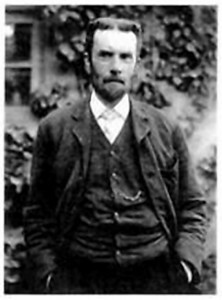 During this period, a British engineer and mathematician by the name of Oliver Heaviside was awarded the first patent (#1407) in 1880 for a basic coaxial cable design. Fifty years later in 1929, the first U.S. patent (#1,835,031) for a modern “concentric conducting system” was issued to Lloyd Espenshied and Herman Affel of AT&T Bell Labs. In the late 1920s and early 1930s, Bell Labs continued pioneering coax design by conducting breakthrough research to determine optimal coaxial impedance. The experimental results were segmented by application, where 30 ohms was optimal for power transmission, 77 ohms was best for low attenuation and 60 ohms for high voltage. A compromise, 50 ohm impedance, has become the resultant popular choice for higher frequency transmission. The increasing use of coax in World War II led to the U.S. government creation of a standard for coaxial cables. The “Radio Guide” handbook designated each cable randomly by a page number; hence the RG standard was born and cables became known as RG-6, RG-58, etc. Today, the industry standard for coaxial cables has evolved into MIL-DTL-17 (formerly MIL-C-17) that is the most comprehensive and widely referenced standard in the industry. As modern demands required frequencies beyond 12 GHz, engineers had to look to new, adaptive coax cable designs for continued innovation. Modern coaxial cable was first designed using large rigid tubing and center conductor wire suspended in air by concentric support rings or an extruded insulating dielectric material. This evolved into semi-rigid, drawn tube construction that could be bent into multi-dimensional forms that provided excellent electrical properties but was cumbersome to bend accurately and required complex documentation. Conformable semi-rigid designs, which used an outer woven braid instead of a solid tube for the outer conductor, were coated with tin plating that allowed greatly enhanced hand-forming. While offering additional flexibility, it was also susceptible to cracking over multiple flexures. The need for greater flexibility led cable design toward a new construction that included extruded thermoplastic dielectrics over the center conductor with outer braided shield(s) and a thermoplastic outer jacket. These first flexible coax cables created tremendous innovation in system design and placed greater challenges on the dielectric medium. Dielectrics provide an insulating layer between two conductors and in the case of coaxial cables, also provide mechanical support for the conductors while keeping them fixed along their common axis. 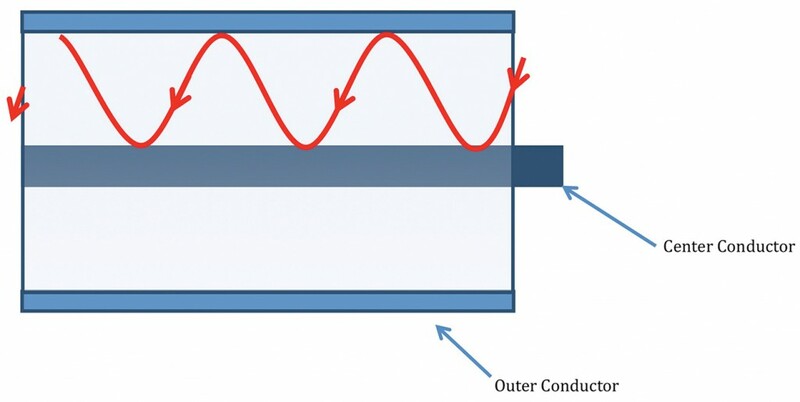 At high frequencies, most of the electrical energy travels through the dielectric rather than the conductors, as shown in Figure 1. The dielectrics in today’s higher frequency coaxial cables, therefore, must have two very important characteristics: low dielectric constants and low dissipation factors. The dielectric constant of a material is used to determine the material’s ability to carry alternating current when compared to air in a vacuum. All materials other than air have a value greater than 1.0 for their respective dielectric constants. To minimize power losses, it is desirable to have the lowest possible dielectric constant in a high frequency cable. Dissipation factor is the measure of the inefficiency of a dielectric material. All dielectrics dissipate electrical power in the form of heat, so the more inefficient a dielectric, the higher its dissipation factor will be. To minimize power losses, it is desirable to use materials with the lowest possible dissipation factor. 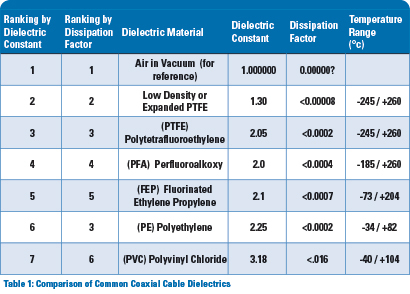 As shown in Table 1, air in a vacuum provides the optimal dielectric material for transmitting electrical energy. Air, of course, is not a practical mechanical support in flexible coaxial cables. The next best material that provides mechanical support is a low density Polytetrafluoroethylene (PTFE). Low density PTFE is also referred to as “expanded” or “microporous” PTFE. These terms describe the same type of material that is standard PTFE with microscopic air spaces distributed throughout. The more air spaces in the material, the lower the density and the better the electrical performance of the composite dielectric. This results in a dielectric with a lower dielectric constant and dissipation factor than solid PTFE, but still with enough mechanical strength to support both inner and outer conductors. The use of expanded rather than solid PTFE became the catalyst for the next evolution in coaxial cable performance. The most widespread manufacturing process for expanded PTFE dielectrics is tape wrapping. 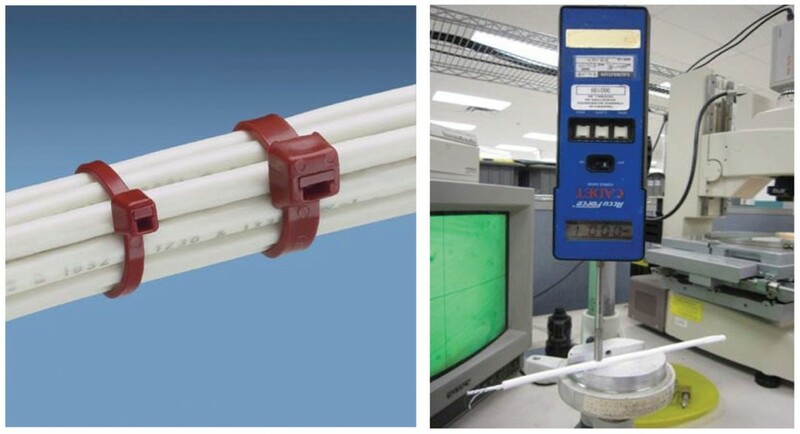 Thin layers of expanded PTFE tape are helically wrapped around the center conductor with overlapping seams using precision taping equipment that allows the PTFE tape to build up to a desired outer diameter. This diameter forms the proper impedance ratio required of the dielectric “core” prior to the addition of the outer conductor. This process has become the mainstream method of dielectric processing for coaxial high frequency cable for over two decades. The latest advances in expanded PTFE dielectrics have come about through an evolution in the manufacturing process. Extruding, rather than tape wrapping the dielectric core, offers several advantages in performance. Dynawave’s DynaCore® dielectric, shown in Figure 2, is an example of this extrusion process used in higher frequency coaxial cables to produce expanded PTFE performance, but with unique electrical and mechanical enhancements. An extruded dielectric core of expanded PTFE produces a more homogeneous, round geometry that can withstand five times more resistance to compression than PTFE tape construction. Table 2 illustrates the percent change under two load conditions between the two processes. Forty pounds per linear inch (40 lbs./in.) would be equivalent to the weight of an average adult stepping on an unprotected section of dielectric core. Eighty pounds per linear inch (80 lbs./in.) equals the force of an over-tightened cable clamp. The superior compression resistance of extruded core provides greater mechanical strength and, in some applications that normally require supplemental armor layers, this can be an alternate approach that is smaller, lighter and more cost effective. One of the most critical mechanical functions of flexible coaxial cables is the ability to bend according to the required installation routing. Flexible coaxial cables must maintain electrical performance while at their defined minimum bend radius. Round geometries become oval in tight bends, causing low impedance sections in coaxial cables. Low impedance results in phase shift and high VSWR. Table 3 provides the percentage change in ovality at two times (2X) the outer diameter of the dielectric for the two types of processes. As the data indicates, the extrusion process retains the round geometry better than tape wrap. Tape wrap dielectrics when tightly bent also may exhibit an expansion in the seams across the outer arc of the bend, while across the inner arc, the seams are in compression, potentially causing a wrinkle or bulging condition. Figure 4 illustrates this tape wrap condition on the left of the image versus the smooth, homogeneous surface condition of the extruded core to the right. 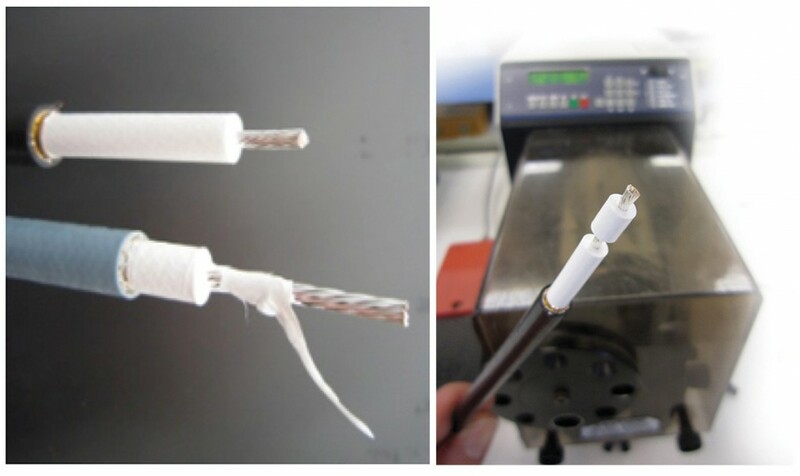 One of the challenges of tape wrap dielectric core is experienced when trimming the cable for connector termination. The tape wrap construction can often deform or “mushroom” when used with some automated trimming equipment or stretch and tear at the cutoff. An added benefit of the extruded form of expanded PTFE is that it holds its round shape better when used with automated or even hand trimming operations. See Figure 5 for a visual comparison. Along with the previously discussed improvement in compression resistance, the ability to efficiently trim extruded core also contributes to consistently better connector terminations, reduced rework and time savings. The ability to trim more consistently improves process repeatability, especially when dealing with critical high frequency matching structures at the cable junction that impact VSWR. The process to achieve tight phase matching requirements is also enhanced by the ability to trim in small increments without gross deformation at the cutoff face while adjusting electrical phase. The manufacturing of high performance, low loss coax cables requires advanced design capability and process control over a broad range of possible variations. Flexible high frequency cables often have three to seven layers of mechanical and electrical elements that all must meet stringent specifications to properly work in unison. Each cable layer is dependent upon sophisticated processing equipment and material technology as the cable is built up to the final jacketing stage. The ability to minimize all types of possible variation across the manufacturing process is paramount to achieve the best level of repeatable high performance. As noted, the dielectric plays an important part in the mechanical and electrical performance of a coaxial cable. Any variation that can be minimized or eliminated in the dielectric medium will enhance cable performance dramatically. We have already discussed the benefits of increased compression strength, resistance to ovality and improved connector termination as they relate to extruded, low density PTFE. The benefit of this process also extends to lower signal noise levels caused by structural VSWR. Today’s demand for higher frequency, low loss coax cables has driven innovations in dielectric design and processing technology. 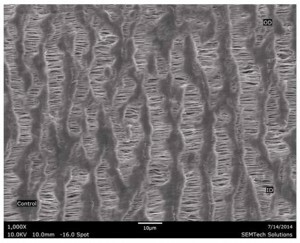 The emergence of expanded PTFE dielectrics using extrusion manufacturing methods have given design engineers new options to satisfy their application requirements by improving resistance to crushing, kinking and twisting; improved connector termination; and overall lower signal noise performance. With these advances in dielectric manufacturing, design engineers now have the choice of specifying extruded, microporous PTFE in their RF coax cables for added mechanical and electrical performance. “Choosing the Optimal High Frequency Coaxial Cable,” Bob Thiele and Stan Hardin, Dynawave, Inc.
“Opening Lines, A Short History of Coaxial Cable,” Gil McElroy. Figure 6: The unique consistency of an extruded, low density PTFE core affords lower structural VSWR for the cable, as shown in Figure 7. This can enable greater “headroom” for tight electrical specifications and reduces fine grain variations in both phase and attenuation.